Tsukiji's OTHER great sushi shack is still some of the best sushi in Tokyo, at an affordable price. 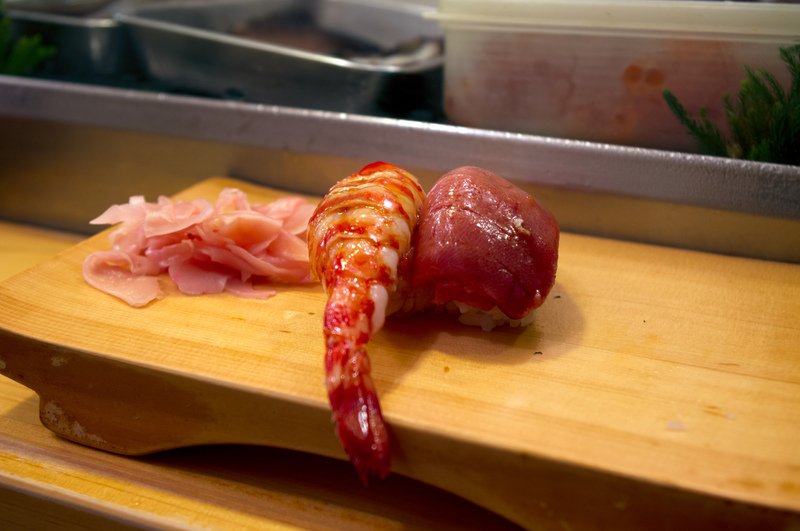 The place is small and has only 12 seats, allowing the sushi masters to do their thing without compromising on quality. There's two options, the omakase (¥35 000) and a la carte, but the menu's in Japanese. If you're not fluent in Japanese just go for the omakase, relax, and let the chef take care of you. You'll be presented with green tea, miso soup, and an assortment presented piece-by-piece and anything you love you can order again separately. You're at Tsukiji, so you're going to want to make sure you get O-toro — fatty tuna belly. It's hard to describe, but I imagine if unicorns were made into sashimi, it would taste a little something like this. Melt in your mouth raw meat, yum! People get here early. I mean 5 am early. If you're lucky there's no line, but expect a wait of about 20-60 minutes, a fraction of the time at Sushi Dai, with comparable quality. If it's your first time to Tokyo, you might want to go with Sushi Dai anyway, they're more tourist friendly and put on a bit of a show for you.